I was just loading up iTunes for my wife and I noticed some software released this year for iPod called BiblePlayer. American Standard Version seems to be the only flavor but maybe more versions are out there. A daily reading plan means you could POD your way through the Bible in 2006. 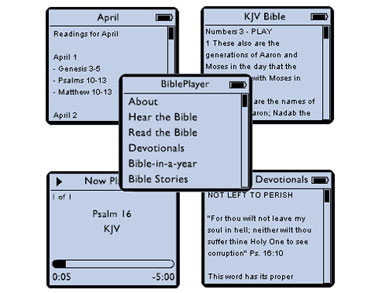 Download BiblePlayer as Freeware from the Apple website. Or pay $20 for a BiblePlayer Deluxe from BibleScreens. The deluxe version has Spanish and KJV, but not my Cuzz’s Bible (Net Bible) which is the version I prefer. In the future, I hope they will add some more versions, and choice of voices for the audio. Anthony Hopkins would be good to listen to. PeeWee Herman for those weird moments in life. Bart Simpson might be popular with my son but his dad would protest. . . a little.